Do your windows look a little bare? Perhaps a crochet window treatment will help. It will certainly be fun to work up and could add some interesting, personalized decor to your home. Even if your windows aren't bare, it can be fun to change up the curtains and get a fresh sense of design into your space. Many people enjoy changing them seasonally to instantly invoke a new mood in the home. Crochet is great for that. Here are eight free crochet curtain patterns to help you redecorate your kitchen, living room, dining room, and bedrooms. And if you're not quite ready to venture into such a big project, consider making crochet curtain tie-backs instead. This terrific free crochet pattern by Moogly works up quickly using tall stitches like the triple treble and a large K crochet hook. Moogly provides instructions for making a longer window curtain in addition to this short version. The design uses a big chevron crochet pattern that could be worked in the alternating neutral color scheme shown here or in any color scheme from plain white to vibrant rainbow hues. The chevron is a classic pattern that works well in almost home. A window valence is the part of the curtain that hangs just on the upper portion of windows, frequently used on kitchen windows. This is a free crochet pattern for a cotton valence. It is a very simple open crochet pattern with enough variation in the stitches to keep it interesting. This is the kind of curtain that is perfect for letting in just enough sunlight to soften the glow in the home while allowing some light to get through so it's not dark in the house during the day! This is a symbol chart crochet pattern for a cute crochet curtain pattern based around the design of hearts. The lacy hearts serve as curtains that cover the uppermost portion of the window, about half the length of a traditional valence. Additional length is added with beautiful curlicue tassels that hang down from the hearts. Instantly brighten up any room in the house with the addition of this floral crochet window valence. It was designed using variegated yarn to give it an interesting color pattern without having to change colors while you work. 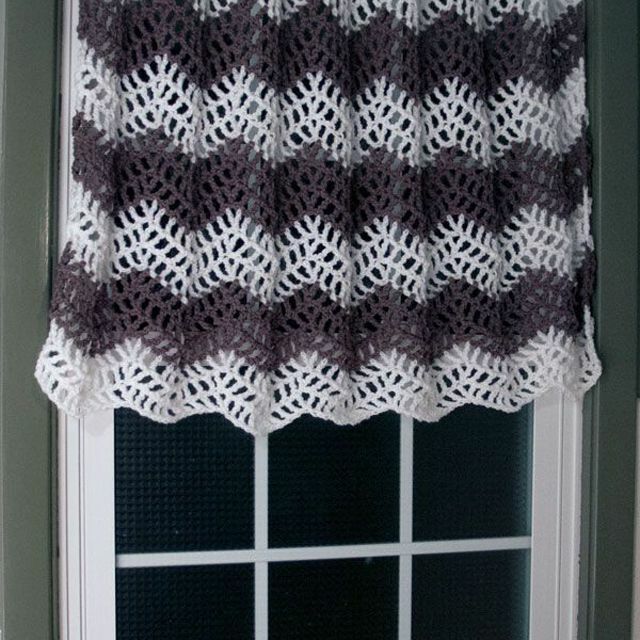 Of course, if you want a simpler look for your home, you could work the same curtain crochet pattern in a single color. Here is a completely different variation on a flower crochet curtain partner. This one uses big, bold flower shapes worked just around the outside edge of the window. This is a fabulous statement piece for the home. Worked in the bright colors shown here it is absolutely perfect for the hippie at heart. Worked in subtler shades, it could be a nice feminine touch for any house. Any crochet pattern that is designed to work as a flat panel (even those for blankets, etc.) can be used to work a crochet curtain panel. That fact is mentioned in this free crochet panel pattern which uses an easy crochet cluster stitch as the basis of its design. You can make crochet panels in different colors for the different rooms of your home. Simple Cluster Stitch Panel by The Shtick I Do! Add a little touch of glamour to your curtains by incorporating bead crochet. The light will glint off of the beads for a really pretty effect. This free crochet curtain pattern is a simple net design that could be worked without beads but when you add the beads in then you get something really special. This would also make a great substitute for a closet door!